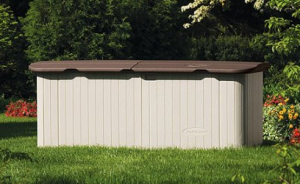 When looking for larger storage options and you do not want or have room for a large shed, another option is the Outdoor Plastic Storage Cabinets. You can store your cushions, lawn equipment (some are big enough for push mover storage), BBQ stuff or just your pool toys when not needed. I have a smaller upright storage cabinet in my three season room for storage of my sons outside toys. 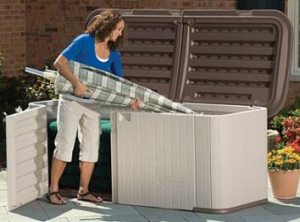 Let's look at some solutions to your larger outside storage needs with these examples. I have included simple assembly instructions for each storage container as some customers have stated they needed instructions on how to put them together. This storage cabinet will give you plenty of space to store your goods. The cabinet is a light taupe color box with a chocolate colored lid and base. The top has to be opened a little to open the doors. A locking provision in the top will secure your goods inside. Top prop is included to keep lid up when getting goods out of the doors. Outside dimensions are 56 inches wide, 31.5 inches deep and 50.25 inches tall. Interior dimensions are 50 inches wide, 24 inches deep and 46 inches tall. It can hold items up to 200 pounds if the weight is evenly spread out. Assembly will not require any addition tools. The enclosed tool will be used to attach the plastic bolts. The right side snaps into the floor. The back right side snaps into the floor and then you have to attach two screws in the corner to secure the back. Snap left back side into floor and use two screws to attach to the right back side. Snap left side panel in floor and attach to left back with two screws. The doors then snap into place, top hinge first then bottom. Hinges for the top come in two parts, one will be inserted in each side of slot in back panels. Roof or top panel click into place on the hinges. 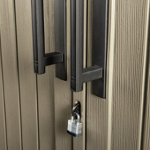 Lock hasp must be inserted into top panel for security. Prop rod must be inserted into slot in top panel and slot in right side panel. Back and side panels have a braces built in for installation of a shelf. See diagram for shelf measurements. After snapping shelf in place you can insert 1.25 inch long drywall screws to secure them in place. 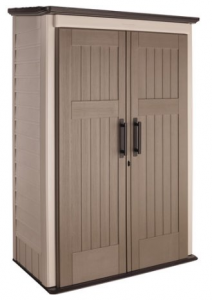 Looking for storage for taller items, this outdoor storage cabinet may fit those needs. 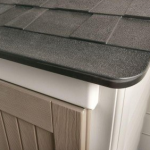 The beige color body with a black angled roof that will let the rain water run off and looks like shingles. Inside your double walled cabinet you will find room to store fishing poles, BBQ tools, small ladders, rakes or shovels, small push mowers, pool toys, cushions, and others out door items that you do not want in your house. Flammable items are not recommended for storage in this cabinet. Internal storage solutions for this model will include notches in the sides for shelves. No shelves are included in the kit. Customers have given these measurements for building shelves that will snap into the notches built in. Use a 1 by 10 foot board, or a 3/4 inch thick by 11 1/2 inch board. Cut board to a 27 inch length. You will have to notch the back corners for clearance. Then you are ready to snap in place. It is not recommended to put a great deal of weight on these shelves unless you use some kind of brackets as they are just held in place by the notches in the sides of the cabinet. The external measurements are 52 inches wide, 31 inches deep and 81 inches tall. Internal measurements are 47 inches wide, 25 inches deep adn 71 inches tall. The shipping box will be 82.125 inches long, 47.875 inches wide and 10.25 inches thick. It will weigh about 90 pounds in shipping box. Check the dimensions as you will need a pickup in most cases to pick up. 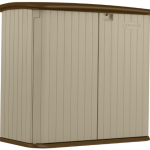 Storage cabinet can be placed on any level area of your outdoor space. It will not work well in an area that is not level or the surface has a drainage problem. Door has provisions for a lock. The cabinet can be attached to a wall for more security and stability by putting some kind of screws into the wall behind the unit. No hardware for this type of installation is included. Assembly should be done with two people, it will go a little faster and you will not get frustrated. Follow instructions in order, it will make assembly take less time. Tools required are just a Phillips screwdriver, you can use a power driver if you do not overtighten the screws. There will be 36 Phillips screws for succuring the assembly of this cabinet. Attach left side to floor panel, place back panel between side panels about four inches off of floor panel (there are slots for alignment), do not snap in place yet. Snap Right panel to floor as the back goes into the slots on the side panel, then slid back panel down to snap into floor panel (customers state that if you put on back first, assembly will be difficult to finish without extra help). Attach hinge panel to top with enclosed screws. When attaching the doors and top you will need at least four hands. Place bottom hinge post in the floor panel, align the top hinge post to the top as you snap the top in place. If you have four hands you can do this by yourself. Snap in one side at a time helps. 14 screws on the back and sides will secure the top to the rest of the cabinet. 6 more screws will attach the base to the sides and back. Door locks snap in from the back and each door handle attaches with 4 screws each. 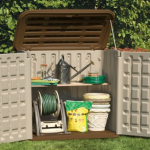 This storage container will hold a lot of your outside stuff. The light beige color with the darker brown lid will fit many outdoor decors. The split lid design and opening doors make getting stuff in and out easier. A lock on the top will keep your items more secure. The outside dimensions are 88 inches long, 36 inches deep and 34 inches tall. Walls are double walled about 1.5 inches thick. Interior dimensions are 79 inches long, 27 inches deep and 29 inches tall. Shipping box is 48 inches long, 24 inches deep and 36 inches tall. Assembly will require no additional tools, plastic driver is inluded. Snap both sides of the floor together on a flat surface. Snap right side panel into floor, then snap right back panel into floor. One plastic bolt will secure the back to the side. Slide the left side back down slots of right side back, snap into floor, secure with two plastic screws. Slid the left side down the left back and snap into the floor. Secure the corner with one plastic screw. The doors wil be installed by sliding edges into slots on the side parts. The doors lock into place with a screw for each side in the top. A screw hand tightens on the right door to lock the doors, an extra screw is included in the kit. This screw must be removed each time you open the front doors. Each hinge will come in two parts, insert one part in each direction in the slots and they will lock in place. Snap each lid to hinges with downward pressure. Insert lock into slot on right door. Opening your cabinet must be done in order. Right lid, left lid, remove locking screw left door and then right door. Closing order is just the reverse order. Made of a strong resin design these storage containers will last a very long time. No upkeep will be required, unless you want to rinse them off from time to time. Making a choice on verticle or horizontal will depend on the items you wish to store. Having a solid foundation will give you more enjoyment with your container as you will not have to worry about it coming apart. Having the ability to secure the verticle container to a wall will help with its stability. If you need some other storage solutions for your outdoor space, see my post on Storage with seating, Small deck boxes and larger deck boxes. I hope that you have found some useful information about Outdoor Plastic Storage Cabinets that will help you decide on what will work for you. Whether you need a vertical or horizontal storage solution, one of these containers should work. If you have any questions, comments or have an item that you need more information about, please use the forms below. I like the idea of storage containers in the yard, it would help keep things nice and tidy. Do they all come with the ability to lock them? And you mentioned they can be placed anywhere with level ground, so you don’t need to but a base of cement or anything, it can sit right on the grass and still be sturdy? All of the storage cabinets on this page can lock. Have to look at each example to make sure that they have that provision. As for the base to sit on, just make sure that the drainage does not erode the grass or dirt under the shed. They just need a solid surface that will not move. This is a great idea. I am definitely sharing this with my mother as she is always lacking space to store her things and she has such a big yard she could definitely make good use of outdoor plastic storage cabinets. Thanks! Having an outside storage area in the winter months will be a great advantage for items that you do not want damaged by the weather.